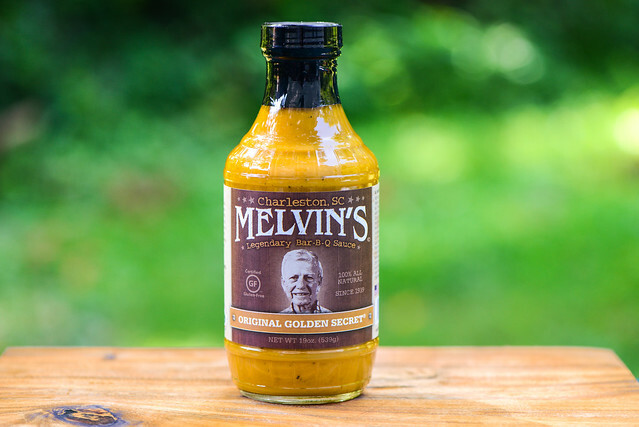 Out of the jar, Melvin's Original Golden Secret has a great balance between sweetness, spice, tang, and the ubiquitous bite mustard while still leaving room for added complexity from Worcestershire that makes it a fine sauce to slather on ribs, pulled pork, and more. Melvin's Barbecue comes with a long, storied family history. It was Melvin Bessinger's father, Big Joe, who actually created the sauce and served it at his restaurant Holly Hill Cafe starting in 1939. That venture was short lived due to the depression, but after WWII, Melvin continued the family restaurant tradition by opening Eat at Joe's, where he served his father's recipes, including his sauce. After taking a break for college, Melvin returned to the restaurant scene with a barbecue drive-in called Melvin's Piggie Park Drive-In that was operated from 1961-1971. With the Bessinger brand on the rise, Melvin's son David took it upon himself to bottle his father's sauce and get it into retails stores starting in the 19080's. From there, father and son expanded their enterprise to a chain of stores, but ultimately scaled back to the two restaurants the persist today in Charleston and Mount Pleasant. Although Melvin passed away a few years ago at age 89, David continues to carry on the family barbecue tradition. A first whiff of this sauce fills the nose with the aroma of yellow mustard spiked with extra vinegar. Just beyond the extra tanginess lays an added depth from what is clearly Worcestershire sauce. While there's a faint sweetness, there's a stronger spice component that smells peppery, but is a bit difficult to discern from the more prominent spicy character of the mustard. 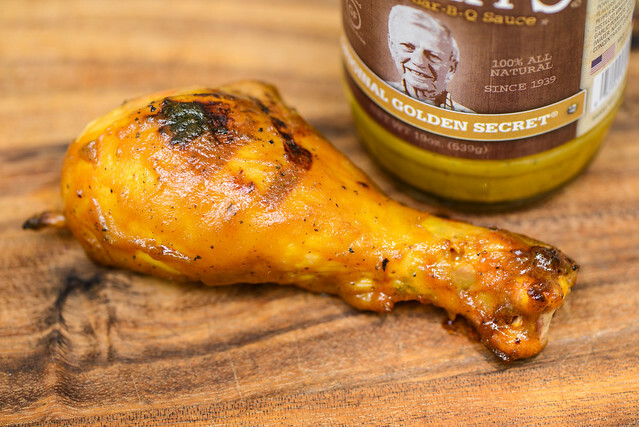 Although opaque with a mustard yellow hue that's a shade or two darker than what comes out of a bottle of French's, you can clearly see a wealth of black pepper specs dotted throughout the sauce. The sauce has a smooth texture with a consistency that falls just bellow the medium-thick marker. From a suspended spoon, the sauce has a quick and steady pour that turns into a few fast drips followed by a few more slow ones when nearing the end. A thin layer of sauce is left coating the spoon when it ceases its fall. While sweetness was light in aroma, there's a very pleasing balance between sugar and mustard on first taste of the sauce. 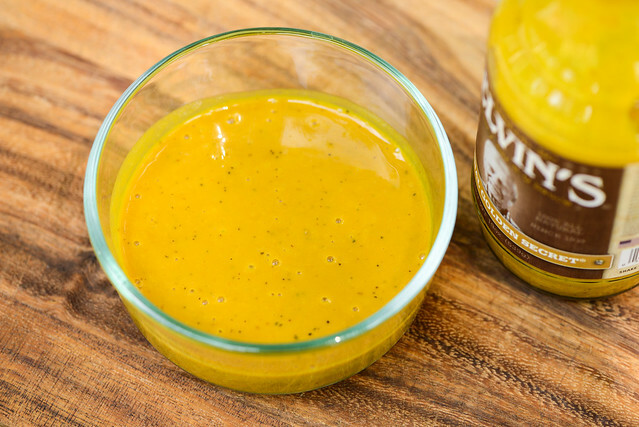 The sweet mustard flavor quickly gains a friend in vinegar that adds a nice upfront tang. 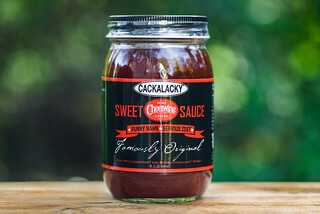 As the sauce settles on the tongue, that tartness overtakes the sugar and the distinct bite of mustard comes into play. It's at this time that Worcestershire makes an appearance, giving the sauce extra complexity that's gains another boost by the presence of pepper by way of black pepper and a spicier pepper sauce. These two peppers, plus the heat of the mustard, define the final flavor with a tang that continues to lingers after all is said and done. The sauce coated the chicken in a medium thick, even layer. It baked down well over indirect heat and caramelized nicely over direct heat, although it also suffered a little sauce burn off as well. The sauce unfortunately lost a lot of its balance and complexity after being cooked. It tasted mostly of vinegar with a slight tang and mild spice. The texture also changed to be a bit gritty, something I found off-putting. After moving, I was super excited for all the news sauces I'd be able to get on the shelves here in North Carolina. 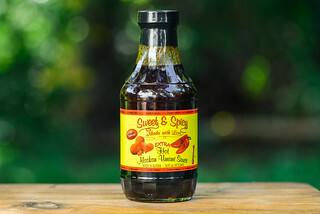 What I didn't factor in was that they'd primarily be vinegar sauces that don't conform well to my chicken/grilling test—I'll have to change the review format up a bit to accommodate the wealth of NC sauces now easily available to me. So I picked up this South Carolina mustard sauce instead—something I'd have been hard pressed to find back in New York. I was lucky to have that random pick end up being a pretty decent one. Out of the jar I thought this was a fine South Carolina sauce, hitting a great balance between sweetness, spice, tang, and mustard. 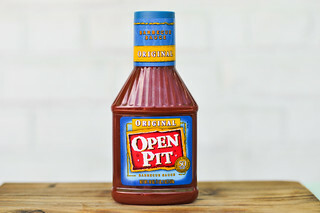 I wouldn't hesitate to mop it on some finished ribs or slather a pile of pulled pork in it. On the grill it didn't fair as well, losing a fair amount of its flavor and taking on a gritty texture. Of course, just like a vinegar sauce, grilling is probably not what this sauce was designed to do, so I'm learning to adjust my expectations a bit from the more Northern norms of barbecue sauce usage.